This Vintage Polaroid is in great working condition and in good cosmetic condition, showing some scratches and scuffs on the bottom and sides of the plastic body from normal use. The lens looks good. The output unit runs well and the pressure rollers spin freely. The original neck strap is well attached, and everything opens and closes easily. Please see photos for more information on the condition. Camera in pictures is the actual camera you will get. This camera has two silver rollers and should not have the jamming problem that the gold and silver roller combo have (explanation below). In the late 1970s, Polaroid began to manufacture plastic-bodied non-folding cameras for their SX-70 film, as an alternative to the more expensive folding SX-70s. Numerous iterations of these “OneSteps” appeared through the early 80s, with slight design variations and features. “The Button” is one of those iterations. 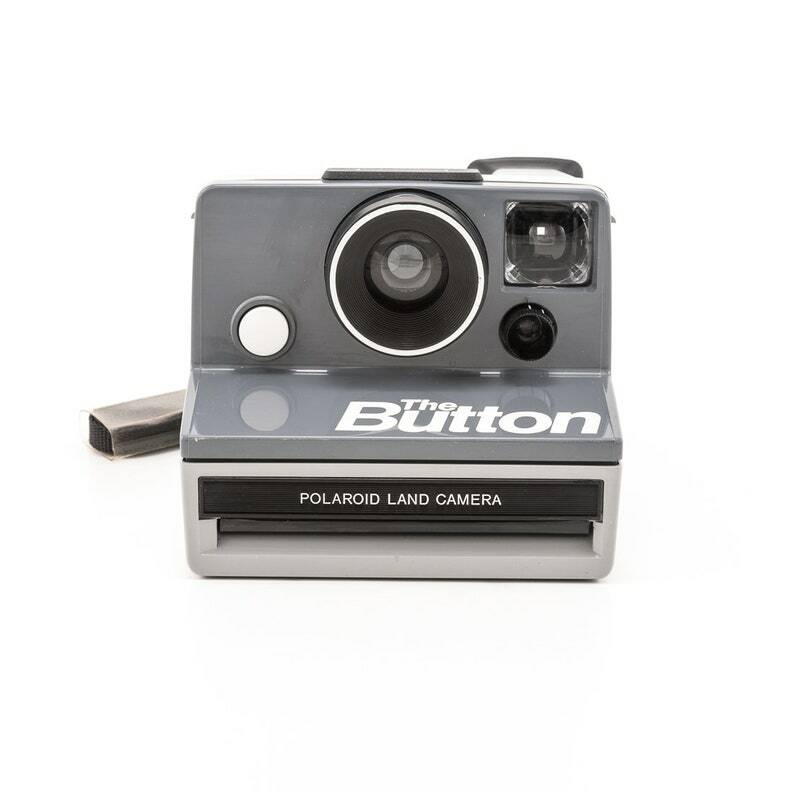 Like the other rigid plastic SX-70 OneStep models, The Button had a single-element plastic lens, fixed focus, electronic shutter, programmed auto exposure and a socket for flashbars or electronic flash attachments. What makes The Button unique is its two-toned grey coloring and stylized “The Button” typeface. This camera has been tested and is working properly. All of our cameras have been pre-owned and therefore may have some cosmetic imperfections scuﬀs or marks. Any imperfections will not get in the way of making great, great images! These cameras take a lot of light for the proper exposure. If you plan on shooting indoors or in shade you will need a flash. When shooting without a flash always shoot outdoors in bright sunlight. Looking for a flash? This flash will work great with this camera. IMPORTANT INFORMATION ABOUT THE POLAROID BOX CAMERAS. The Impossible Project changed the thickness of their film and it sometimes gets jammed in the rollers of these cameras. If you have a Onestep White Rainbow with 1 silver roller and 1 gold roller you might have the jamming problem. Hopefully, The Impossible Project will adjust the thickness with their new formula. Be sure to check out the other pieces in the shop.